Each day for the next whole bunch of days, I'll be introducing you to someone who has been waiting to spill their beans about joining this team! Lisa has a such a soft and feminine design style. but it never matters because it's always awesome! I'm so excited she's here!! 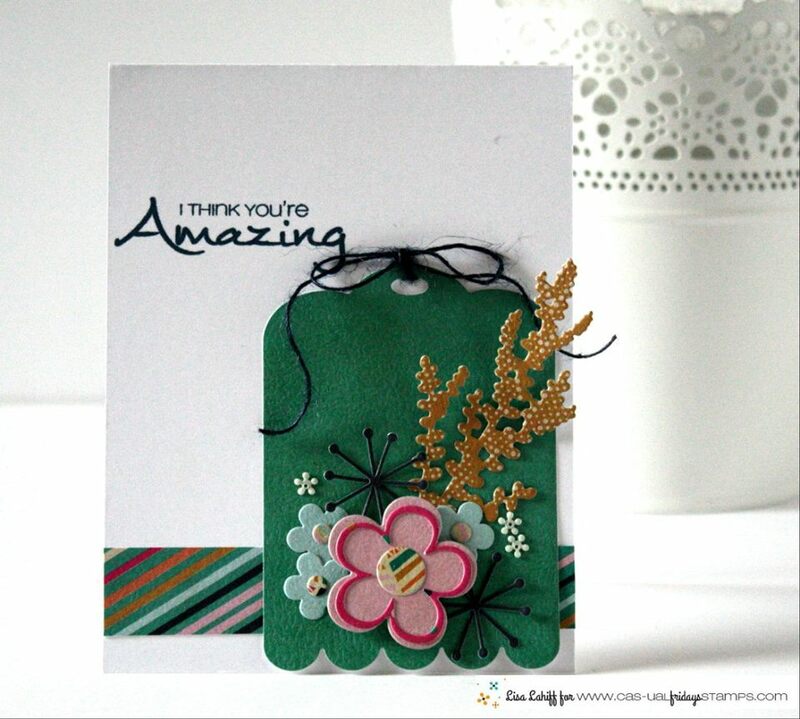 I adore the sweet tag she created to be the star of her card. She used Scallop Tags, Friendly Flowers and Casual Trees Fri-Dies to create all those delicious layers and then added a sentiment from Mon Ami to finish it off. 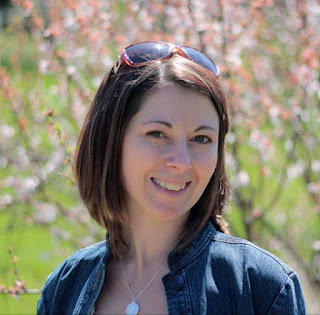 Be sure to check out Lisa's blog so you can get to know her better and see more of her beautiful style! She has something for you too! You'll want to leave some love for each of the new designers on their blogs to increase your chance of winning! 1 lucky random comment from our introduction week will win a $50 gift certificate! I'll be back tomorrow with another introduction! I love Lisa's pretty tag... awesome layering of these dies! Love how all the dies were put together to make this beautiful tag. Such an awesome card. Welcome! Very cute! Looking forward to Lisa's creations here. I'm so glad Lisa was added to the DT - I struggle with multi-layered cards! Can't wait to be inspired by her work. Welcome, Lisa! Congrats, Lisa. LOVE your card!!!! Can't wait to see more of your work!! Wow, beautiful tag, and I love how you pull from different sets! Congrats, I'm excited to see more of your crafty goodness! Huge congrats to Lisa and the Ink Squad! Lisa is so talented that she will make CAS-ual Fridays Stamps SHINE!Yay! Gorgeous tag card and I am from Ohio too. Such a lovely tag card! Congrats and welcome, Lisa! Your card/tag is gorgeous! Love all the little details. Such a beautiful card! Congratulations to you, Lisa! Off to check out your blog. Congratulations, Lisa! Such a wonderful card! I absolutely love all of the prettiness on your tag! Very pretty! Love your style! Welcome Lisa! Can't wait to see more of your awesome projects! Beautiful tag love the layers and colors. Congratulations. So delightful! Welcome Lisa, looking forward to see more of your beauties! Congrats Lisa! Love your clustered tag card. So fun. Love the addition of felt for the tag. Just beautiful. So pretty. It will be interesting to see the work of someone who masters both CAS and layered designs. Hello Lisa from Ohio...lol!! Your tiny tag is too cute!! Wow! Beautiful card! LOVE the tag design ♥ Congrats, Lisa!! Congratulations Lisa! Fabulous card, terrific tag. Gorgeous tag. Love the colors and flowers. Love this idea. The elements you put together on the tag look fantastic. Oooh, I love those Casual Trees dies! 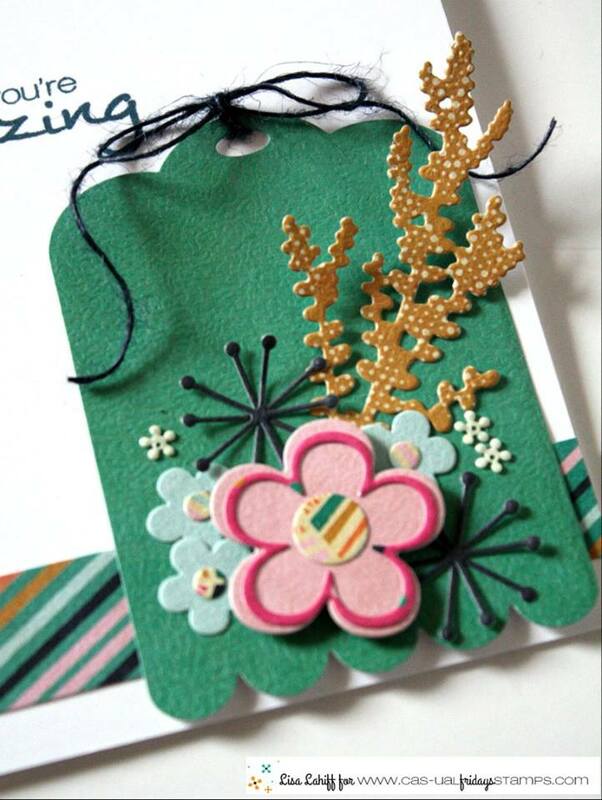 They add such a nice element of texture and color to the tag and combine with those sweet little flowers. Love that layered tag on the CAS background! I am loving this gorgeous tag! Absolutely fabulous combination of goodies! Thanks so much for sharing! Love your use of felt. Hooray! Lisa is truly one of my favorites. So kind, so talented! Congrats on making the DT! This cute little scalloped tag card is so fun. I love the different die cuts and bit of twine. Beautiful card/tag! Congrats and glad to be introduced to your work! Lisa, congratulations on your new Girl Friday assignment! Your colorful tag is amazing on your card. Eager to see your talents shine!